No reviews yet for this trip. Browse other reviews below for Odysseys Unlimited. The small group concept works extremely well. Big buses but only one to a seat if you want to stretch out. Unique and upscale hotels, good food, and personable guides. The pace is not rushed and you will see places "off the beaten path." The only dilemma, which tour do we choose next? Top notch and everything was taken care of. I finally learned to truly live in the moment ... Loved every minute. Fascinating country that you must visit using Odyssey Travel as they truly have amazing tour guides, fantastic hotels, courteous and safe bus drivers, and great itineraries . Arrive Cairo We arrive in the Egyptian capital and transfer to our hotel. As guests’ arrival times may vary greatly, we have no group activities or meals planned. Cairo After a morning briefing, our full-day tour begins at the acclaimed Egyptian Museum, the world’s greatest repository of ancient relics. Then we tour the Citadel of Saladin housing the alabaster Mosque of Mohamed Ali; later this afternoon we navigate bustling Khan el-Khalili bazaar. Tonight we enjoy a welcome dinner at a local restaurant. Cairo Today’s tour starts at the open-air museum at Memphis, Egypt’s first capital (early 4th century BCE). 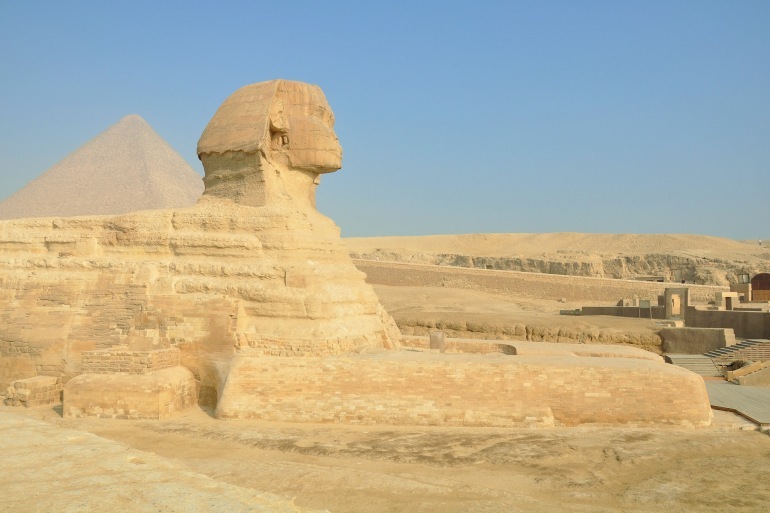 Here, too, we encounter the enigmatic Sphinx, whose leonine body and human face were carved from a single piece of limestone. We continue on to the necropolis at Sakkara then to the astounding Pyramids of Giza, the wonders of antiquity that have drawn visitors for millennia. Cairo/Aswan/Embark Lake Nasser Cruise Early this morning we fly to Aswan. Upon arrival we tour the Aswan High Dam, considered a marvel of engineering when completed in 1965. Then we visit the Nubia Museum, an acclaimed showcase of Nubian art and architecture with more than 3,000 ancient relics and 90 monumental pieces. From here we board our Lake Nasser ship in time for lunch then explore the ruins of the acclaimed Temple of Philae. Tonight we dine on board as we overnight in Aswan. Lake Nasser Cruising – Kalabsha Temples/ Wadi el-Seboua Today we see some sights of ancient Nubia, Egypt’s neighbor in antiquity but with a distinct culture and traditions. We stop first at “new” Kalabsha, the largest freestanding temple of them all that was moved and reconstructed on higher ground after the construction of the Aswan High Dam (and the subsequent flooding that created Lake Nasser). Then we sail on to Wadi el-Seboua, where we dock for the night. Lake Nasser Cruising – Wadi el-Seboua This morning we see two important New Kingdom temples that, like Kalabsha, were dismantled and relocated to make way for Lake Nasser. We explore Wadi el-Seboua, the next largest of all the pharaonic temples after Abu Simbel, and see the Temple of Dakka, with its huge, well-preserved pylon. Returning to M/S Prince Abbas, we sail on to Amada, where we encounter the oldest of Nubia’s Egyptian temples, the 18th-dynasty Temple of Amada. Lake Nasser Cruising – Amada/Kasr Ibrim/ Abu Simbel We sail this morning to Kasr Ibrim, the last remaining Nubian settlement in its original location. As it is forbidden to go ashore here, we learn about this ancient site while overlooking it from the ship’s sun deck. Then we continue on to Abu Simbel’s massive complex of temples guarded by statues of Ramses II and his wife Nefertari, with well-preserved murals inside. Like the other temples, Abu Simbel also was dismantled and moved to higher ground, stone by ancient stone. Disembark/Abu Simbel/Aswan/Embark Nile Cruise Ship We disembark then travel by coach to Aswan, where we board our Nile ship. This afternoon we take an afternoon sail aboard small feluccas, replicas of ancient Nile sailboats. Nile Cruising – Aswan/Kom Ombo/Edfu We cruise today to the site of the ancient trading town at Kom Ombo, with its unusual double temple and outstanding Nile views. We sail on to Edfu, where tonight we attend a shipboard party wearing the traditional Egytian galabeya. Nile Cruising – Edfu/Luxor/East Bank This morning we visit Edfu’s Temple of Horus, Egypt’s best-preserved ancient temple. Then we cruise to Luxor, the world’s “greatest open-air museum,” whose vast temple complexes, tombs, and statues dating from 2755 BCE represent the pinnacle of Egyptian architecture. Today we explore the East Bank, home of Karnak, the greatest temple complex of them all, whose ruins stretch for more than a mile. We also visit Luxor Temple, whose builders included both Tutankhamun and Alexander the Great. Back on board, tonight we enjoy a show of Middle Eastern belly dancing. Disembark/Luxor/West Bank We have the option to rise very early to see the West Bank from above on an optional hot air balloon ride. After we disembark our ship later this morning, we tour the haunting Valley of the Kings, where 34 royal tombs feature magnificent paintings; and the Valley of the Queens, whose dramatic Temple of Hatshepsut honors one of the few female pharaohs. We also see the massive Colossi of Memnon, two 64-foot high statues of Amenhotep III that once guarded the gates of his own tomb. Then we check in at our hotel where this afternoon is at leisure. Luxor/Cairo We fly to Cairo. After checking in at our hotel, we visit the lively Kahn el-Khalili bazaar. Cairo This morning we encounter Old Cairo, the district where early capital cities once stood and now only remnants remain. We visit 5th-century St. Sergius Church, the Coptic church of el-Mauallaqa, and Ben Ezra Synagogue, built in 882. Mid-day we return to our hotel where tonight we enjoy a farewell dinner. Depart for U.S. Early this morning we transfer to the airport for our return flight to the U.S.
Prices are per person based on double occupancy in an outside cabin on both cruises and include airline taxes, surcharges, and fees of $602, which are subject to change until final payment is made. Single travelers please add $995. Your $375 deposit is fully refundable up to 95 days before departure. Discover the fabled "rose-red city, half as old as time" on this exciting exploration. Plus: ancient Jerash and the capital of Amman.